As the cricket season begins, students at Kent benefited from the expertise of several experienced cricketers on Saturday 4th April at the University of Kent sport facilities. 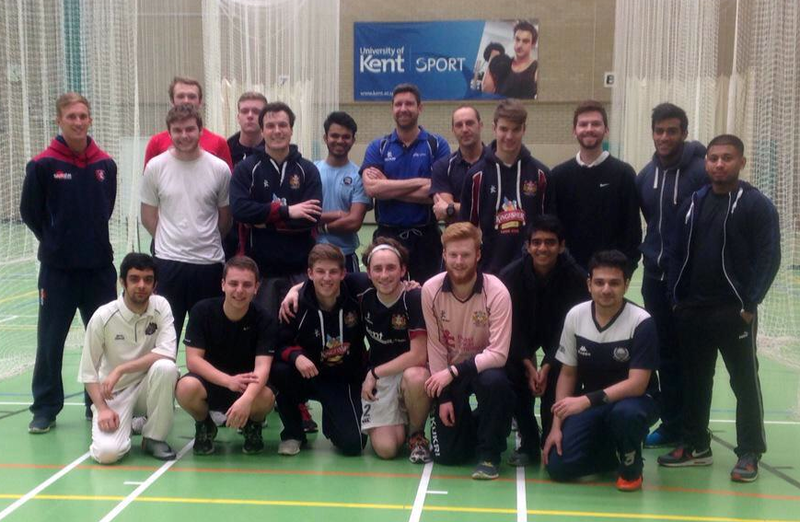 In celebration of the University's 50th anniversary, a Cricket Masterclass was presented by Ben Trott, Assistant Director (Operations) at Kent Sport and former Somerset and Kent professional. Along with former Kent County Cricket Club Assistant Coach and Analyst Phil Relf, the group was also joined by former Kent Sport cricket scholar, ex-England under-19 skipper and Kent all-rounder Adam Ball as the special guest. The 22-year-old is a graduate of the University and Kent Cricket Academy and returned to the campus Sports Centre to work on technique and tactics with members of the University cricket club. Ball discussed his winter in Australia playing grade cricket in Queensland and the new season ahead. The masterclass provided the students with hands-on experience, along with discussion and a Q&A session about analysis and review, fielding, batting and ball striking, bowling and nutrition, as well as demonstration and coaching. The University of Kent will take on Canterbury Christ Church University in the Varsity Match at The Spitfire Ground St Lawrence on Friday 22nd May with men and women competing for the pride of the county’s student cricketers. To find out about Kent Sport events, please visit the calendar www.kent.ac.uk/sports/events and follow UniKentSports on Facebook and Twitter.